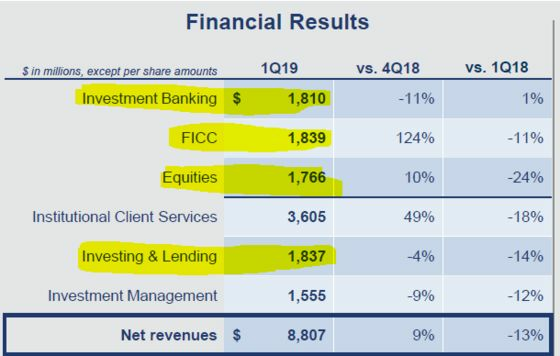 (Bloomberg) -- Quarterly earnings can be messy, but the financial results for Goldman Sachs Group Inc.’s first quarter were oddly clean -- thanks to a mix of tough times for traders and happy ones for its bankers. Investment banking revenue posted a surprise jump from a year earlier to $1.8 billion, while the fixed-income trading business fell 11 percent to $1.8 billion. Equities trading had an even bigger drop to $1.8 billion. Revenue from the bank’s investing and lending business was also down -- to $1.8 billion. The only one of the firm’s five major businesses that didn’t hit that number was the firm’s investment management unit -- which had $1.8 billion in revenue a year ago.